“I was scared as our ship approached the beach. I knew it was gonna be tough and I had a wife and children back home. I imagine I was saying some prayers,” the 98-year-old retired family physician from Garwin, Iowa, who winters at La Casa mobile home park in North Port, Fla. said. Their landing craft grounded on a bar just off the beach. “Our battalion commander was first to drive off the ship’s ramp in his staff vehicle into 14 feet of water,” Schaeferle said. It went to the bottom and the colonel popped to the surface and scrambled back onto the ramp. The second time he tried it in another vehicle he was successful. The doctor found a three-foot deep trench on the beach dug by the Germans before the Americans arrived. It provided him protective cover from enemy fire while treating wounded soldiers. His job: Operate a front line aid station. “While working on wounded soldiers in the trench about all I could do was stop the bleeding, give them a shot of morphine, bandage ’em up and send them on by stretcher bearer to waiting LCTs (landing craft) that would take them to a hospital ship off shore,” he explained. “The use of a doctor to run an aid station up front was a waste. As a captain, I was over-qualified for the work I was doing. A medic could have done what I did. 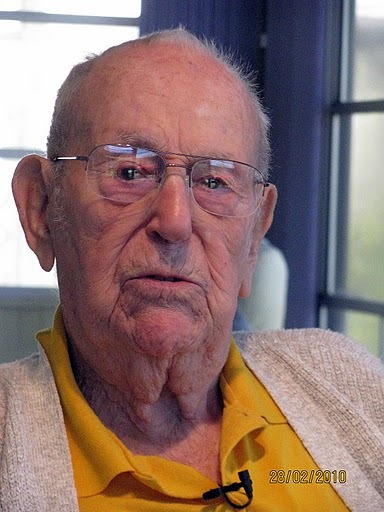 “While the war went on all around me on Omaha Beach I worked on the wounded. I wasn’t worried about what was happening on the beach. I concentrated on trying to save soldiers’ lives in the slit trench with me. I did everything I could to stop the bleeding and keep them alive. The hell with the enemy fire,” he said. The 16th Infantry Division was the first American unit to land on Omaha Beach. It was followed an hour later by the 18th Division, according to the doctor. “The 16th wasn’t on there long before Col. Taylor, the division commander, told his men,’You have to get off this beach or you’ll all die.’ He pointed toward the 100-foot hill towering over the beach. The colonel led them to the top single file.,” Schaeferle said. “Because the beach was mined the soldier behind their leader tried to step in his foot prints going up the hill. They cleared a path through the enemy barbed wire and mines with Bangalore Torpedoes (an explosive device that opened the way for them). “A German machine-gun nest at the top of the hill was sweeping the beach with gun fire. Naval guns were called in to take out the enemy machine-gun emplacement. “Many of those soldiers sacrificed themselves so the 16th Division could reach the top of that hill. 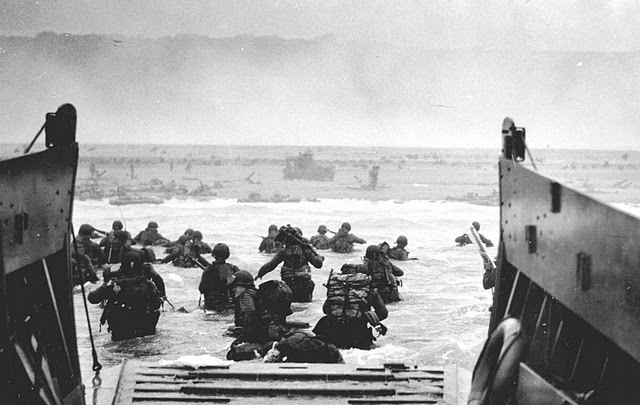 There were a lot of soldiers who should have received Medals of Honor on the beach that day but didn’t,” the doctor said with tears in his eyes recalling their bravery 65 years later. When Schaeferle got to the top of the hill over looking Omaha Beach he found a burned out farm house he converted to an aid station. For the next few days the physician worked out of the battered home as Allied forces pushed the Germans off the beach and further inland. His unit spent time in the hedgerows with tens of thousands of other soldiers. 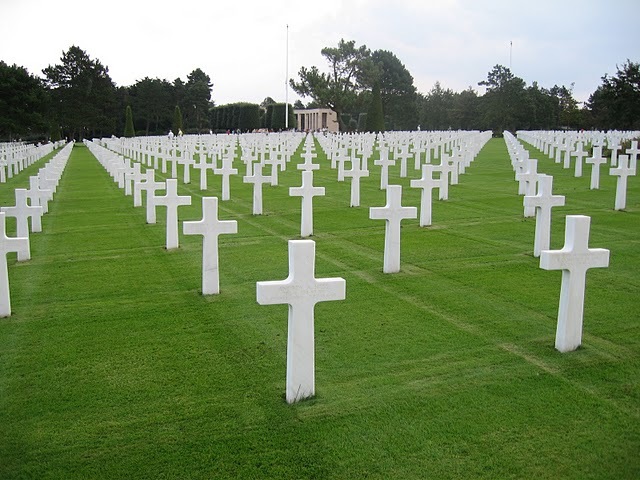 Eventually U.S. troops fought their way through the protective hedges around French farmers’ fields and out into open territory as they moved on through France. Just before The Battle of the Bulge began in mid-December 1944 the doctor’s younger brother, Martin, came to visit him. “He was also a doctor – serving with the 9th Armored Division attached to Gen. George Patton’s 3rd Army. On his way back to his unit he drove right through the German advance on our lines and didn’t realize it until later,” Schaeferle said. “The 1st Division was on the north shoulder of what became The Bulge. We were almost surrounded by the Germans. Our 105 Howitzers were firing in three directions,” he said. During the month of fighting in Belgium before the Germans’ unexpected advance was blunted, Schaeferle found himself in a foxhole behind the front lines treating soldiers who were not only suffering from gunshot and shrapnel wounds but frost bite and trench foot. It was the coldest winter in 50 years along the Western Front. “After the Germans were stopped at The Bulge the 32nd Battalion’s guns were atop a hill. We were looking down on the retreating enemy army. They were pulling their cannons and equipment with horses. It was a duck shoot for us and our 105s,” the old soldier recalled. From there they fought on through the Siegfried Line, protecting the western entrance to the “Fatherland,” and into Aaken, the first German town his unit captured. It had been destroyed by artillery and bombs. “I found an abandoned civilian hospital at Aaken and relieved them of some of their medical supplies. The hospital staff was gone,” he recalled. By that time his brother and the 9th Armored Division had taken the bridge across the Rhine at Remagen, Germany. Schaeferle’s unit crossed the span shortly before it collapsed. When the Germans surrendered on May 8 1945, Schaeferle and the 32nd Artillery Battalion had stopped at Cheb, Czechoslovakia. “Nothing was happening. We watched as thousands of German soldiers marched through our lines trying to flee from the Russians. Our battalion went with the 1st Division to a base outside Paris. From there it was on to Lisbon, Portugal and a ship home,” he said. 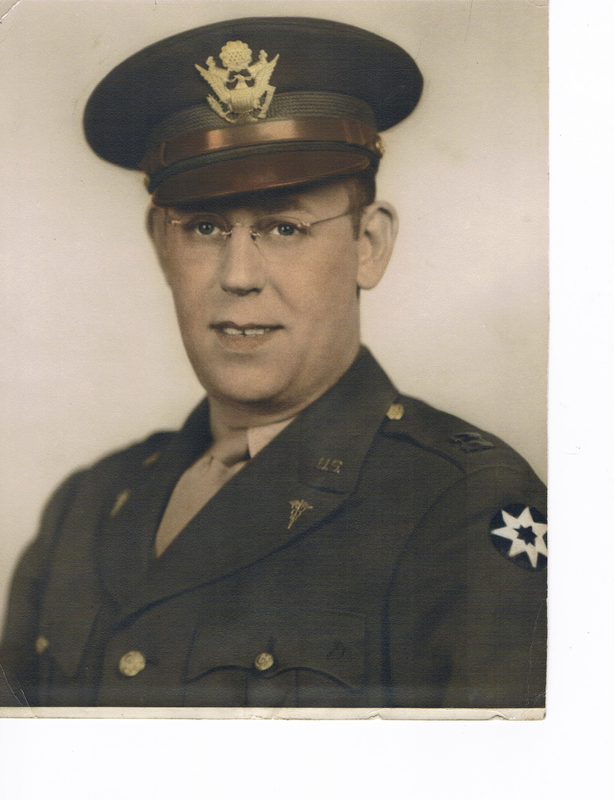 Dr. Lawrence Schaeferle, who enlisted in the Army on May 14, 1941 was discharged on Dec. 13, 1945. He first landed in Oran, North Africa in 1942 where he was assigned to the 32nd Battalion. He took part in the Invasion of Sicily in ’43 before hitting the beach at Normandy in ’44. He returned to Garwin, Iowa, a small farming community of 1,000 residents, and practiced medicine for half a century. The doctor and his second wife, Mary Jane, have wintered in North Port since 1985. This story was first printed in the Charlotte Sun newspaper, Port Charlotte, Fla. on Monday, Nov. 29, 2010 and is republished with permission. Click here to view Schaeferle’s Collection in the Library of Congress’ Veterans History Project. Click here to view the War Tales Facebook fan page. Dr. Lawrence Schaeferle, 100, of Gladbrook, IA passed away Tuesday, August 7, 2012, at his residence while under the care of Iowa River Hospice. Funeral services will be 10:00 a.m., Saturday, August 11, 2012, at Peace United Church of Christ, in Gladbrook. Visitation will be 5:00 p.m. to 7:00 p.m.,with a 6:30 p.m. Masonic service, Friday, August 10, 2012, at Peace United Church of Christ, in Gladbrook. Interment will be at Maple Hill Cemetery in rural Gladbrook. The Goettsch Funeral Home, in Gladbrook has been entrusted with the arrangements. In lieu of flowers memorials may be directed to Shriners Children’s Hospital. Online condolences may be sent to http://www.vogelfuneralhomes.com. Lawrence was born January 25, 1912 to Martin F. and Sena (Sliekers) Schaeferle in Hancock, IA. At about the age of 6 months he and his family moved to Garwin, IA. He graduated from Garwin High School in 1929, Cornell College in Mount Vernon, IA in 1933, pre-Med at State University of Iowa in 1936, M.D., interned 1936-37 Methodist Hospital Jackson Clinic, Madison, WI, 1937-38 U.S. Marine Hospital, Galveston, TX. He returned to Iowa and started a medical practice with Dr. A.F. Walters. In 1939 he purchased Dr. Walters’ clinic in Gladbrook where he stayed until 1981 when he retired. Upon graduation form medical school the U.S. Government offered him a commission of Captain in the U.S. Army Reserve, which he accepted. Again in 1940 the U.S. Government called upon Doc to be in the regular U.S. Army and he was sent to Ft. Leonard Wood in Missouri, where he helped build many barracks, desks, and any other items needed. Doc was on a troop train going to Virginia when the Japanese attacked Pearl Harbor December 7, 1941. Doc was shipped to Oran, Africa and joined the “BIG RED ONE”, First Infantry. The invasion of Sicily followed, then onto England to prepare for the invasion of Normandy on June 6, 1944. The First Infantry was in the second wave on the beach during the first hour. As a doctor, he was on the front line for the rest of WW II. At the end of the war, Doc was commissioned to Major and returned home to Gladbrook in December 1945. Doc married Virginia “Tommy” Blaine in 1936, they had two children, Karen Schaeferle Larkin and Mark Blaine Shaeferle. Tommy died March 8, 1965. Doc married Mary Jane Chmielowski Blaine, August 16, 1965. Doc was a lifetime member of the American Medical Association and the Iowa Medical Association. He was a member of the American Association of Family Practitioners. He was a 76-year member of the Masons, 64-year member of the Order of the Eastern Star, 66- year member of El Kahir Shrine, 67-year member of American Legion Post 127, President of Gladbrook Commercial Club, President of Gladbrook Library, Board member of Westbrook Acres Nursing Home, North Part Shrine Club in Florida, Board member of the Lake and Park Corporation for 61 years, LaCasa Veterans Club in North Port, FL. Doc’s hobbies included woodworking, golf and two handed pinochle with Mary Jane. His number one passion was as a family practitioner in Gladbrook. Doc will be missed by his wife, Mary Jane, son Mark (Joyce) Schaeferle, daughter Karen, step-daughter,Jody (Bob) Boldt, step-sons, Chuck (Cindy) Blaine, Larry (Cindy) Blaine, grandchildren, Mark Schaeferle, Beth Dufton, Lynette Glynn, Lisa Larkin, Tami Pierce, Lance Larkin, Laurie Healey, Carrie Wimberley, Duane Blaine, Laurel Blaine, Dylan Blaine, Derek Blaine, great grandchildren, Kayla, Bridgette, and Tommy Dufton, Zachary and Tyler Pierce, Bronwyn and Rashel McNeully, Will and Casie Glynn, Joshua and Ashlyn Wimberly, Sydney Moser, Katie and Jarid Larkin, Brityn Blaine. He was preceded in death by his parents, wife, son Tommy, brother and sister-in-law Martin and Ann Schaeferle, loving Aunt Reikie and Uncle Raymond Jorgensen of Garwin and an infant sister. Credit to Times Republican (Iowa) August 10, 2012. I couldn’t be more proud of my father. He has truly lived an eventful life filled with care for his fellow men. His generation will be truly missed. Incidentally, he also received the Silver Star which was finally awarded to just a few years ago. Doc, was my childhood Doctor. I am thankfull for having such a caring doctor for our fine small town. Didn’t know this about him. Thanks for the great article. And thanks Doc! He told a great story about being in that trench on the beach at Normandy on June 6, 1944 and working on wounded soldiers trying to keep them alive until they could get these G.I.s back to a hospital ship off shore for treatment. You have every reason to be proud of your father. As my step-father, I can not be more pleased that his words have gone to print nor can I, like Mark, be more proud of this private man. Decency, compassion and sense of duty are part of his genetic makeup. His generation, The Greatest, is one we should all try to mirror in our actions. My uncle served driving supplies to the front as we moved from Africa and into Germany. Each man with the alies is a hero to me.